Earlier in the week, reports suggested that Microsoft is working on a new version of Windows 10, calling it Windows Cloud. These suggestions were based on the references to the name in the last few Windows 10 Creators Update Preview builds. While details remain scarce at the moment, first screenshots of the operating system have leaked out. 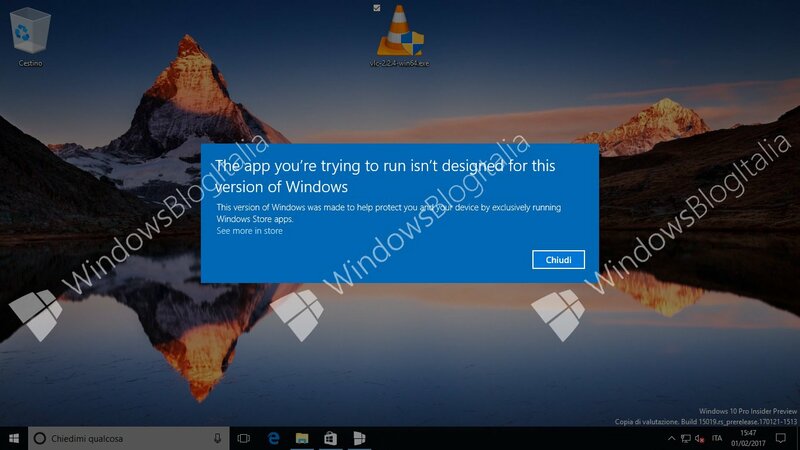 It was earlier suggested that Windows Cloud will only be able to run UWP applications from the Windows Store. The latest leaked Windows Cloud screenshots confirm that, along with showing a UI that is very identical to Windows 10. While the platform is still in an early stage of development, which means many things will change, it’s expected that the Redmond software giant will keep it similar to Windows 10 while focusing on UWP apps. Pushing Cortana, Bing, and Edge forward, Windows Cloud is said to be a reincarnation of Windows RT. Notice, however, that the screenshot says the version is Windows 10 Pro Insider Preview. Windows Blog Italia has confirmed with registry keys that this is indeed Windows 10 Cloud. It’s unclear when is Microsoft planning to introduce Windows Cloud. Since the OS has started to make some waves, and with a build already leaked out, the release could be sooner than expected. The company is said to be working on Windows Cloud to compete against Chrome OS and Chromebooks. With Windows 10 Creators Update reportedly coming in April, we might just get to see the official Windows Cloud release at the same time.